Calculations for the section properties of steel shapes. Calculations for the design of steel columns. 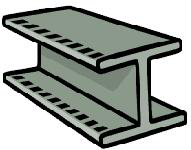 Calculations for the design of steel beams. Calculations for the design of structural steel tension members. Calculations for the design of structural steel welded connections and welding of structural steel. Calculations for the design of steel connectors and bolted steel connections.